I have had such a lovely half term pottering: reading (latest William Boyd); cooking (including homemade soups); eating out; visiting the cinema (Dad’s Army); marking (Years 9, 10, 11); knitting (scarf – still on-going); running (10K coming up next month) and sewing (ties x 2, sweatshirts x 2) BUT what I really want to share you today is my finally finished Sew Over It Francine Jacket of which I am super proud. 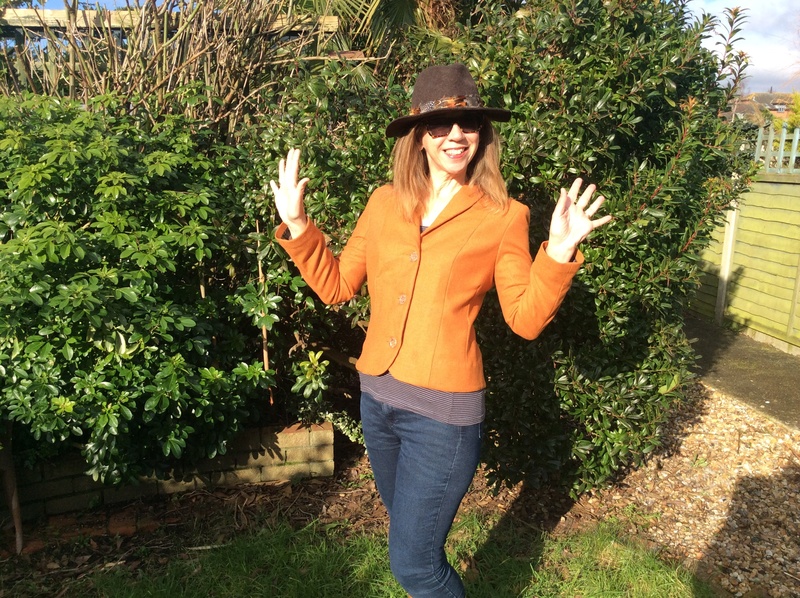 Beware – this is a picture heavy post: we are talking about a jacket six months in the making! 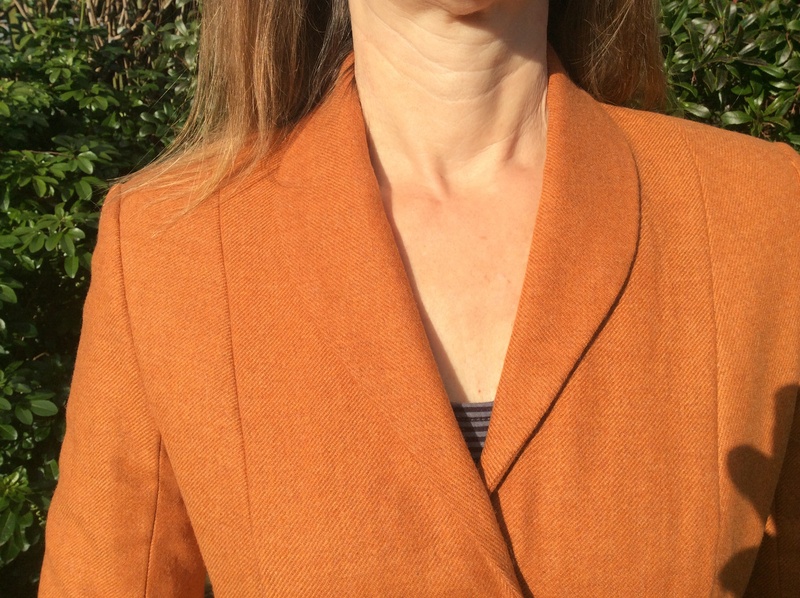 Way back in August I met up with some lovely ladies at the Fabric Godmother Open Day and bought this amazing wool suiting fabric for, I think, £15 a metre. I had it in mind to make a maxi skirt suit so that I could waft around at work looking like a suffragette. 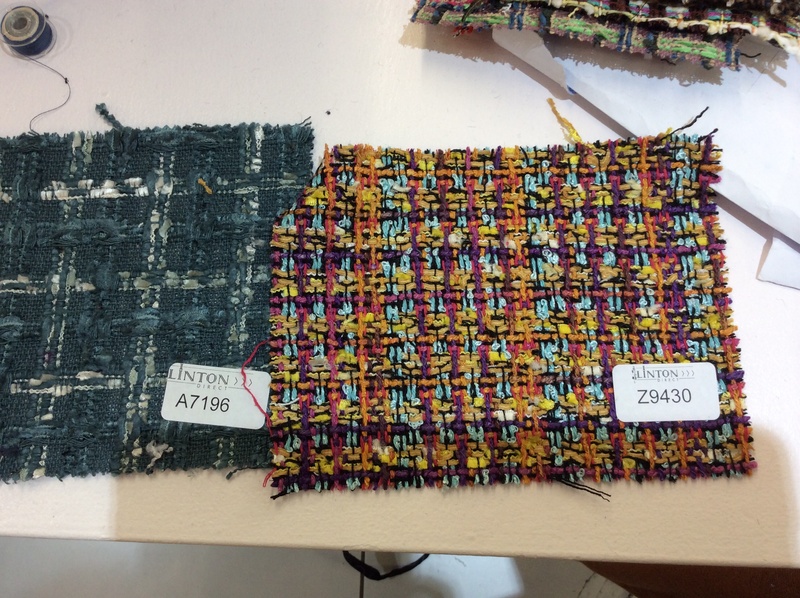 I decided I would have to cut a few pieces out of the skirt material – what a good idea this turned out to be as the contrast really works and it will certainly look much more like a suit rather than coordinated separates. Progress continued at class during week two. 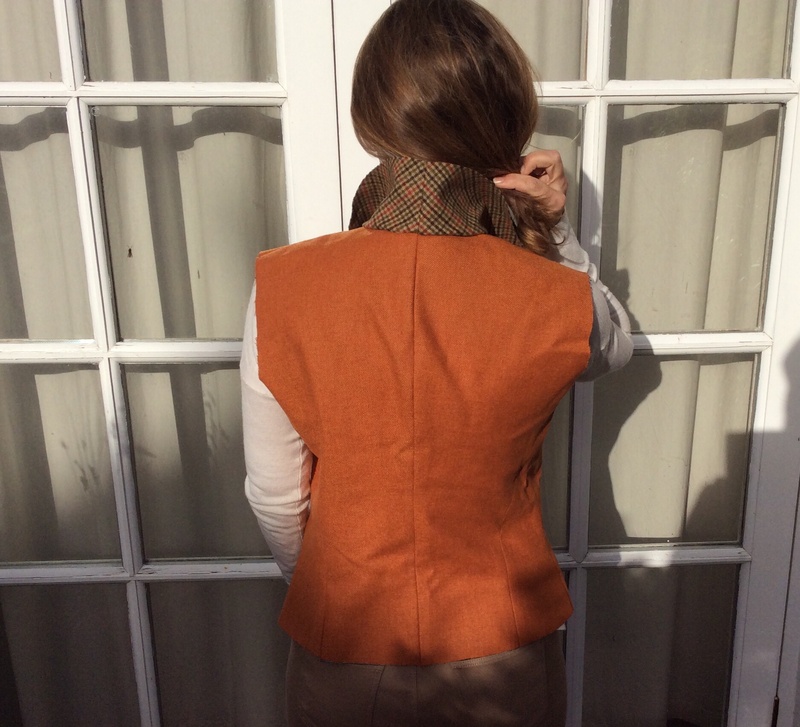 We had made a number of alterations for my big shoulders and curved back but once I tried the jacket on it wasn’t right and I had to undo most of what I had done. Week three – our final class and it became clear early on I wasn’t going to get finished. In fact I hadn’t even got my lining in by the end of the evening. What I had done though is learn a really valuable technique whereby you fill the sleeve head with wadding before you insert the shoulder pad and it gives it a more smooth line. 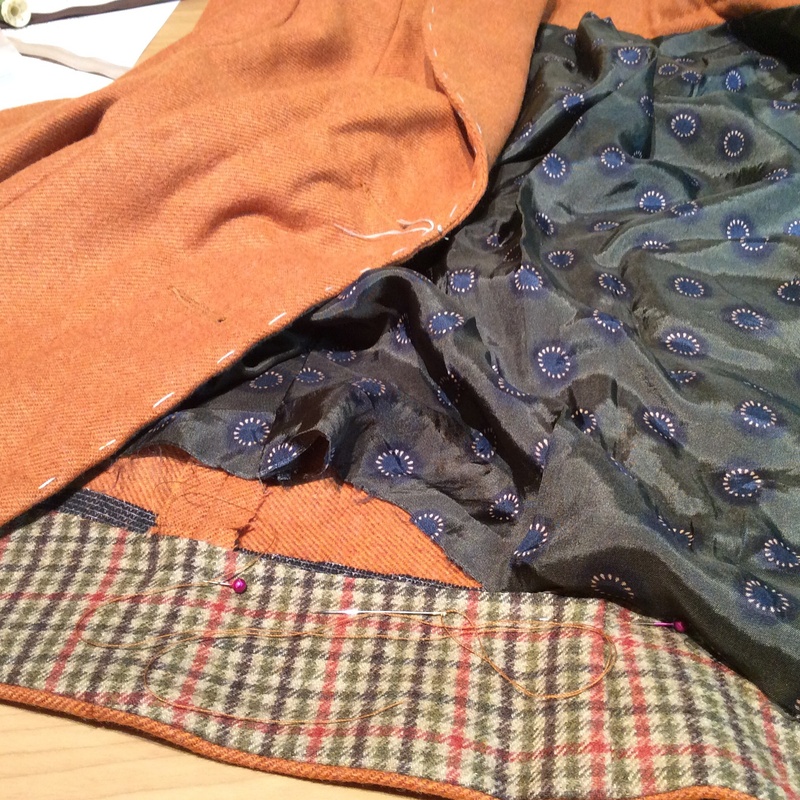 I was full of good intentions of finishing the jacket the following week but became ensconced in all manner of other things throughout November/December. During January I picked it up again. The impetus was that I was going to the Liberty exhibition and planned to call in on the button man in Soho for him to do my button holes for me. 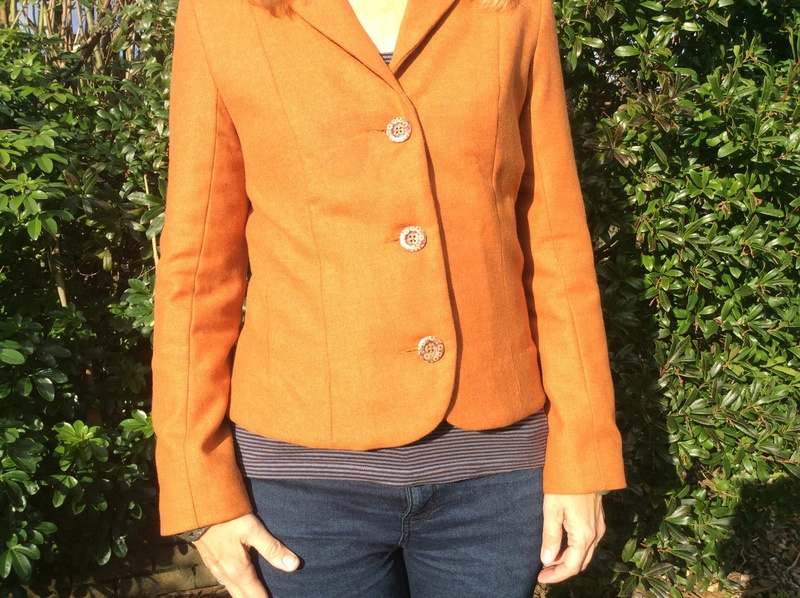 I am not going to lie – I really struggled to finish the jacket by myself. Whilst the instructions were good, I struggled to make out the tiny detail, particularly on the black and white photos. 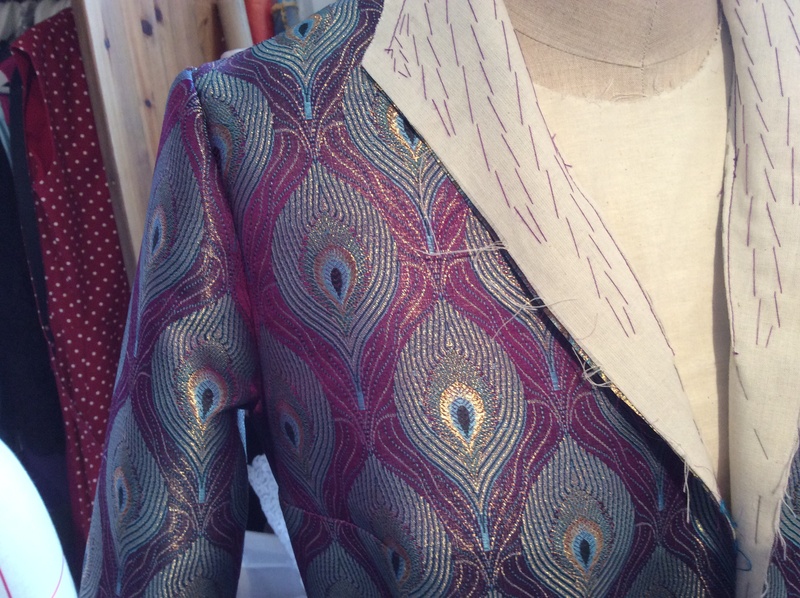 If the button man thought it odd to be presented with an unfinished garment to add the finishing touches to, he never gave any indication – just sent me off to Liberty and told me not to rush back! 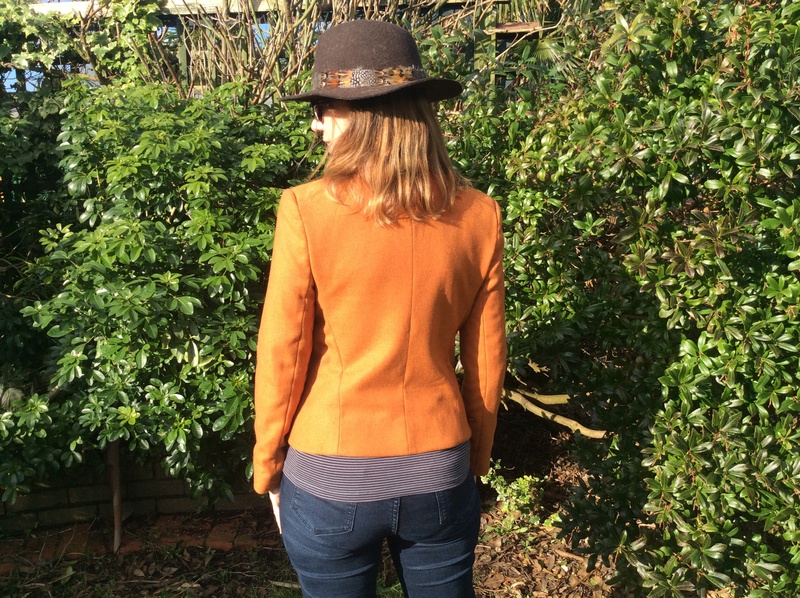 I finally finished the jacket in February – to be honest, looking at the pics I think I should have taken more care over pressing it; the jacket has gotten so squashed on its various train journeys. 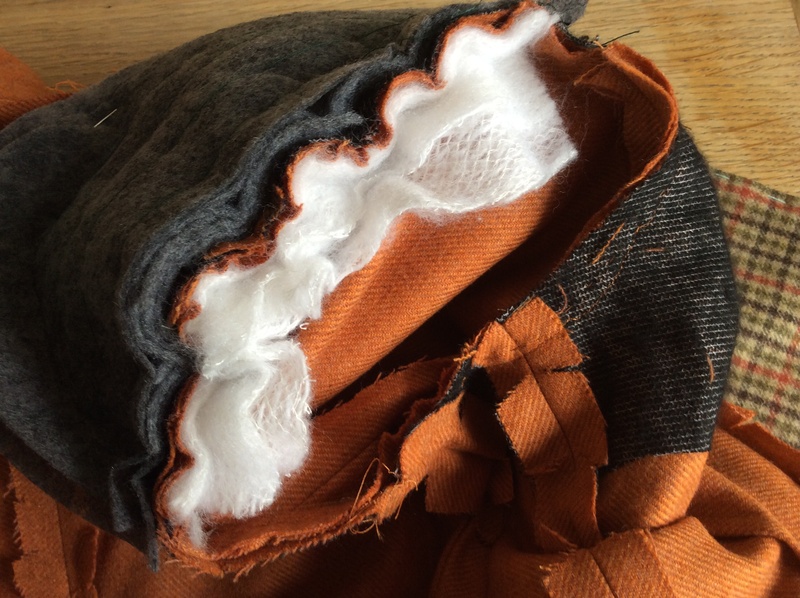 So there you have it – now I just have to get on with the skirt but I suspect other projects will rush to the fore and it’ll be another six months. Would you like some detail shots? Of course you would if you have stuck around this far .. The story of Francine is concluded – I hope you enjoyed it! 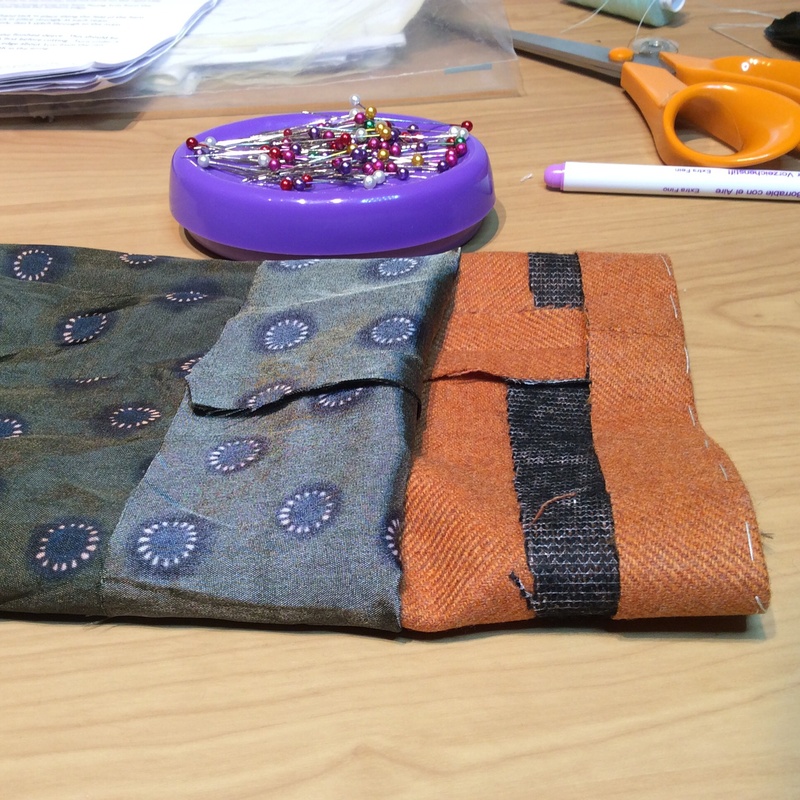 As you may guess from the title of my post I have been busy with sewing related activities but there has been little on the actual sewing front – I have a busy week ahead so anticipate the same but next week ….. 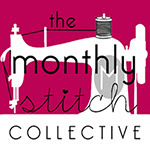 This morning I have the last of my six sessions on the introductory pattern drafting workshop at Cloth Kits. It has been a really interesting course, taken at a leisurely pace with an amazing tutor, Maria Pulley. The final outcome should be that we will have made blocks for bodice, sleeve and skirt and have a toile made up for a dress of our own design. Here is my princess seamed bodice which I constructed over the weekend and hopfully today I will decide what I want to do with the skirt – currently thinking seven gored. 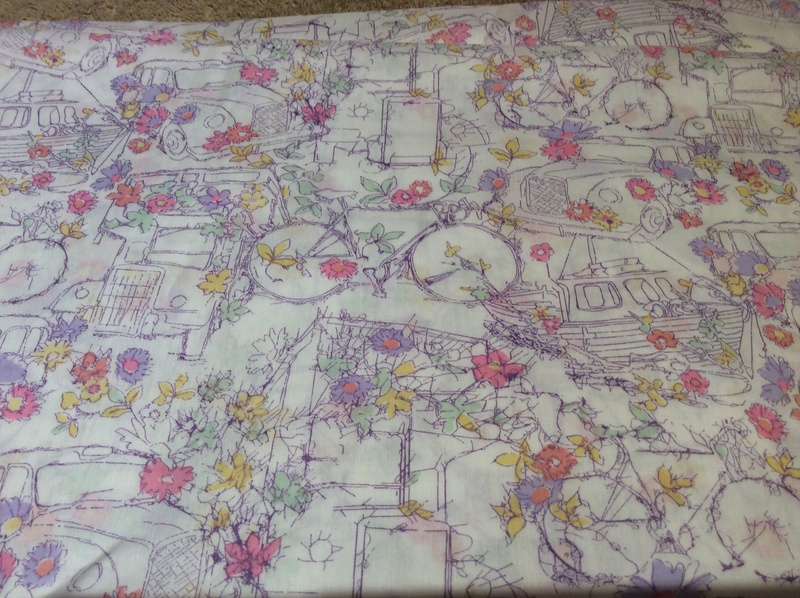 In terms of fabric I am going for this which was bought last week during the inaugural SEWBESS meet-up at Ditto Fabrics. 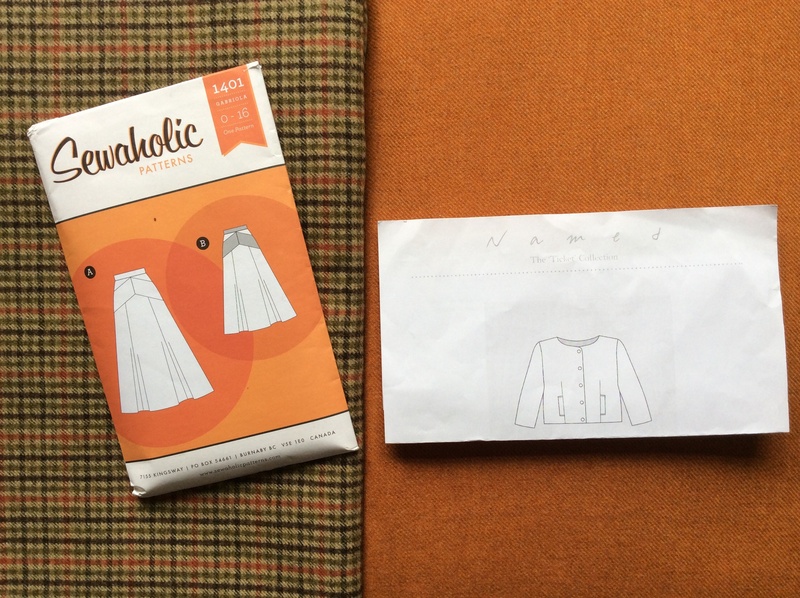 The plan is to make the dress in the MOD green wool with sleeve cuffs and belt in the check. 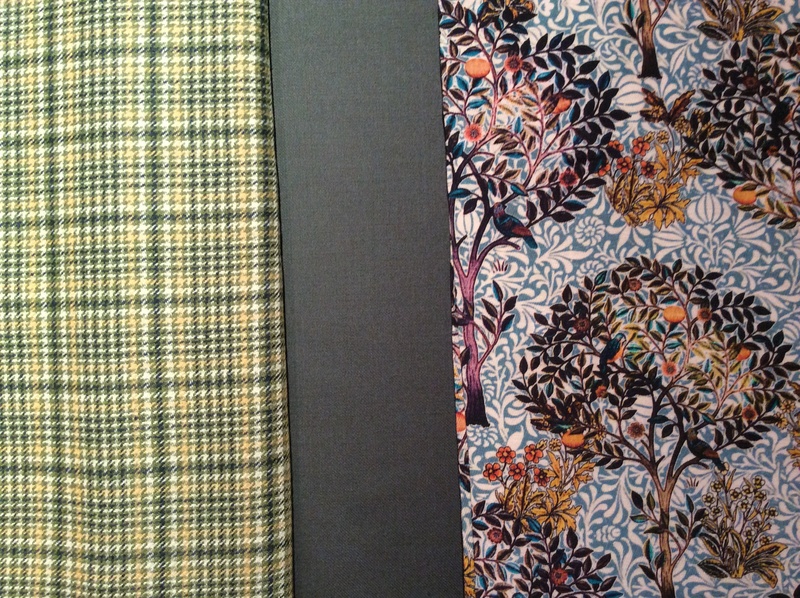 I also rather extravagantly bough the floral viscose to use as a lining (more on that later). 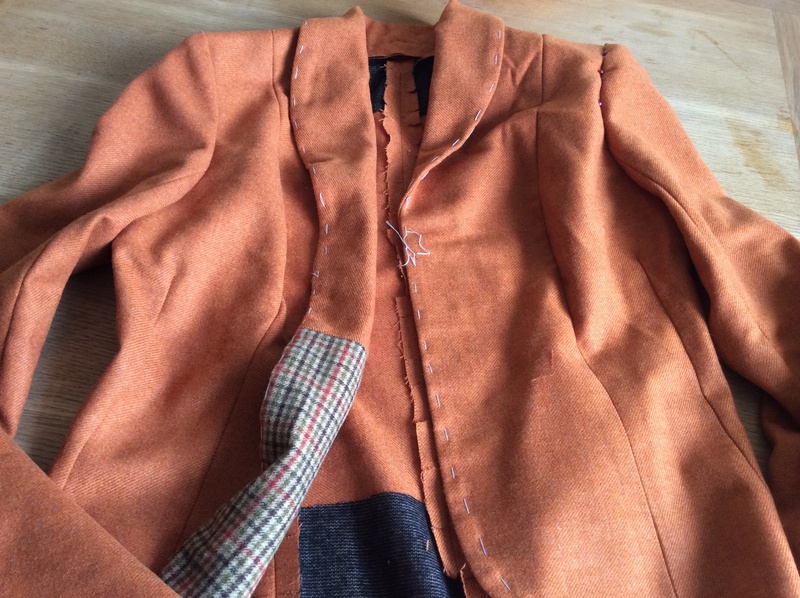 The rest of the check is to make a “consolidation” Francine jacket – once I finish the one which is currently still sans lining. The idea is to make a new dress/jacket suit for my new job in January. 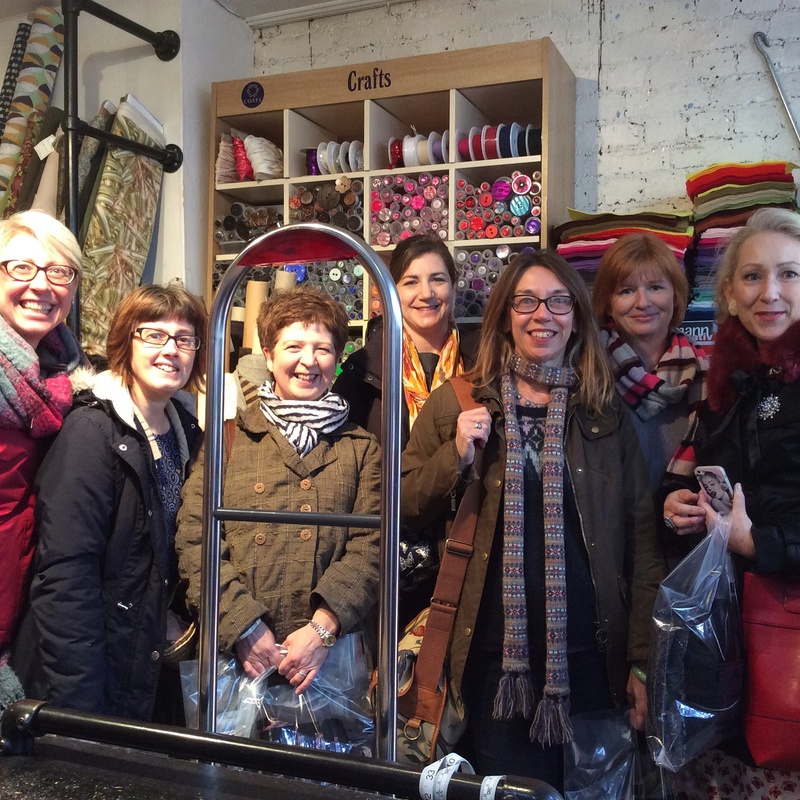 I had planned to write about my meet up with these lovely ladies who are all fellow bloggers and met originally at one of the two Open Days at Fabric Godmother. However Jane has written such a good post on the event I would only be repeating it so if you are interested, please read here. I would just like to add that although we are all based on the South Coast we live in three counties between us so please feel free to join in too. 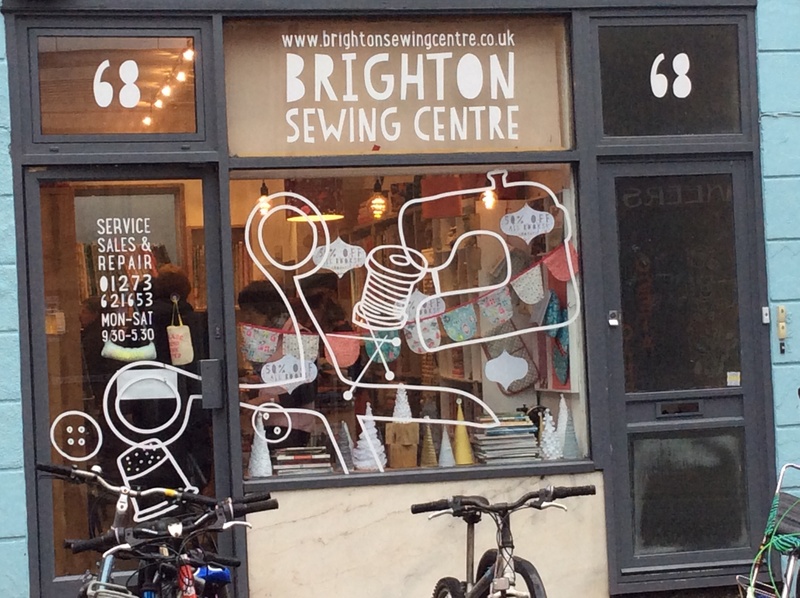 At the Brighton Sewing Centre I managed to get the perfect buttons for my yet to be made check Francine jacket and some sparkly zips caught my eye although initially I had no idea what I was going to do with them, I do now! 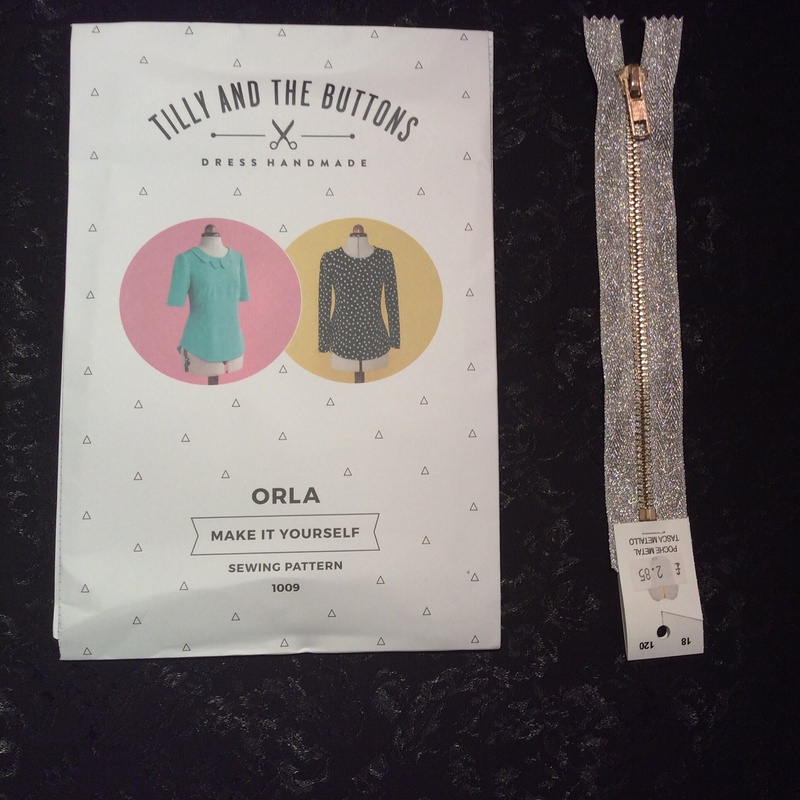 I only bought one thing in the Black Friday sales and that was the Orla pattern from Tilly and the Buttons. I have decided to make it up in black jacquard (I hope I have enough left over after making my maxi Anna) and use one of the sparkly zips. Finally back to that viscose. I had been thinking and thinking about this fabric. Whilst I think it is wonderful to have a funky lining, I kept thinking it was just too pretty to be hidden away. 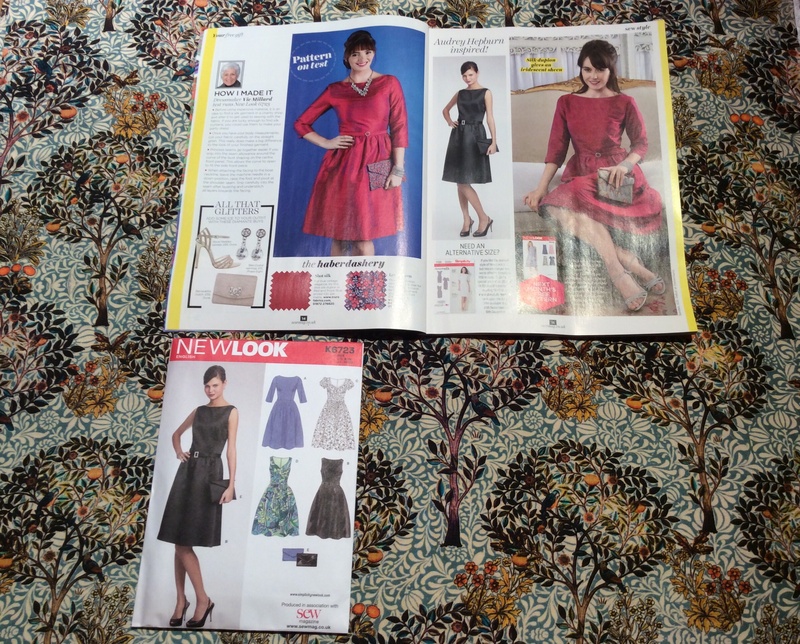 I then noticed the party dress pattern with the December issue of SEW Style and Home and thought that it might be perfect to make up my Christmas Day dress. So that is the plan. Although as you can see, I have a lot of plans and quite a few WIPs. Presumably others have that problem – so busy buying fabric and making plans and seeing friends that your rate of output is insufficient to keep up? Well it’s time for me to scurry off and get ready for my final workshop – lunch afterwards with my fellow student Debbie who I have struck up a lovely friendship with – us sewing peeps are such a lovely bunch! I will leave you with a final photo of the fabric because it really is beautiful and the colours are more like they are in real life. Have a FAB, Festive week. Hello sewing chums, hope you are having a good week. My plans for today have been thwarted. 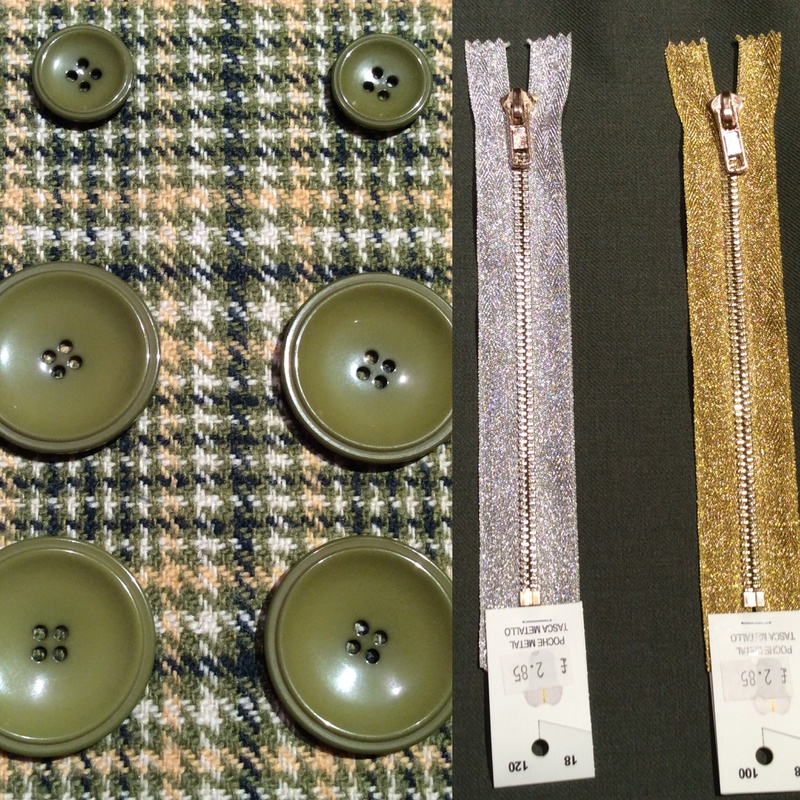 As last night was the final session in my Francine Jacket workshops at Sew Over It, I had planned to visit my old friend, the button man of Soho (read this post if you want to know more). However, this is the state of my jacket at the time of writing (and don’t even ask me about the lining). I am disappointed. I had to fight off feelings of despondency which threatened to overwhelm me all evening. I think I must be a right pain to be with on a workshop. Having completed my homework (which took hours), the subsequent fitting saw my sleeves having to be ripped off and reductions made to the centre back, side back and sleeves. 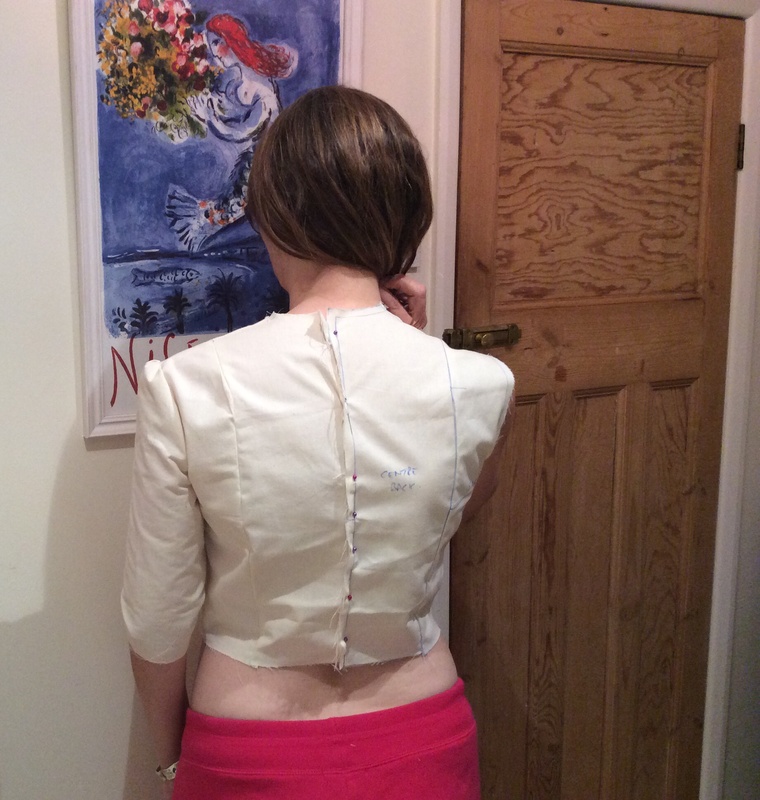 It seems that all of the bits I had added in to accommodate my shoulders have had to be removed. The sleeves which I had taken up to a 16 are now down to an 8 – weird. Anyway, twenty minutes before the end of the class I was back to the point I had been when I arrived! I have learnt a lot this time about tailoring techniques. 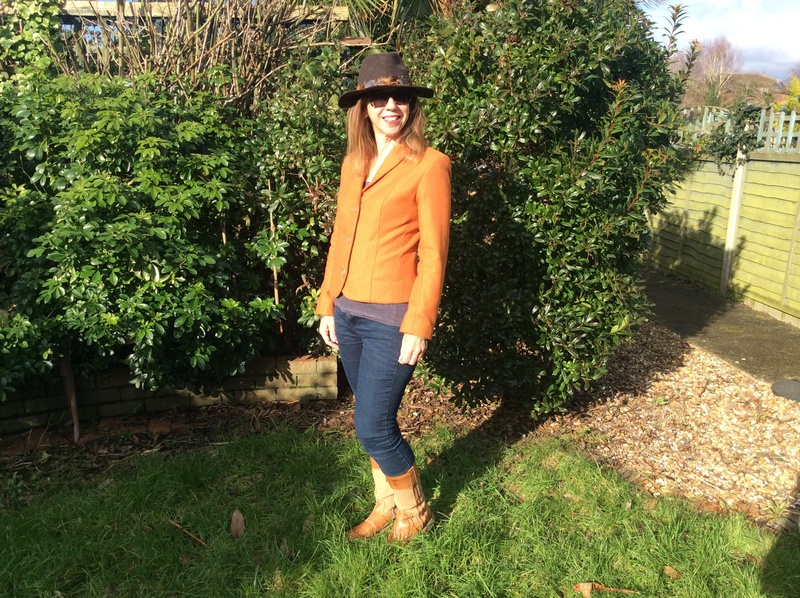 A new thing for me was something called …. I thought Julie called it ICE WOOL but I just looked that up to double check and I obviously have got it wrong. So , if you know, please tell us all via the comments. 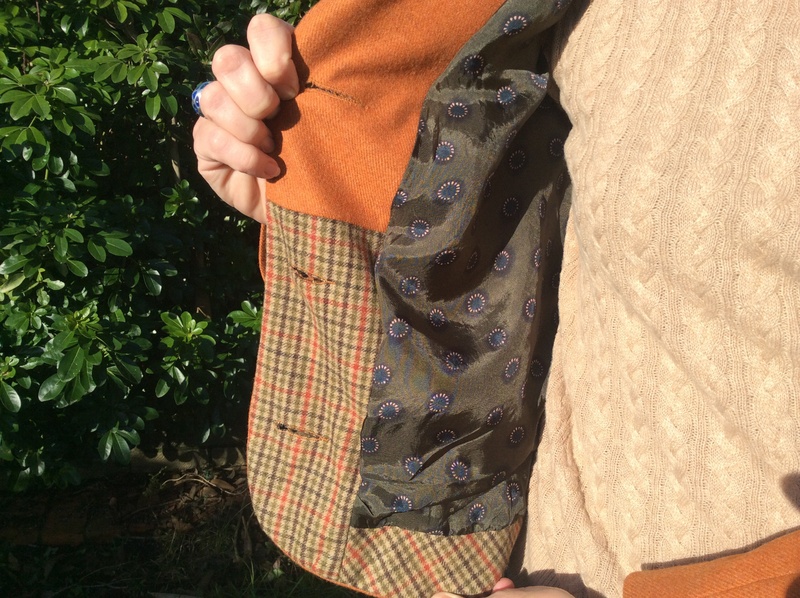 Anyway, it is a small piece of material, incredibly soft and fluffy which you sew into the sleeve head, ahead of the shoulder pads, just to smooth out the line of the sewing, prevent the seam allowance from showing and just make it all look a little more polished. I’m not the only one behind – none of us finished so there are no photos to show you of us all proudly wearing our jackets. The tutor Julie is amazing; so patient. She was still there at 10pm when I left helping the last student to make sure she knew how to finish. I just hope I can remember what I need to do! Hopefully this time next week I’ll be able to post a photo of my finished Francine. As soon as I finish I plan to make another (you’ve heard that before haven’t you!). 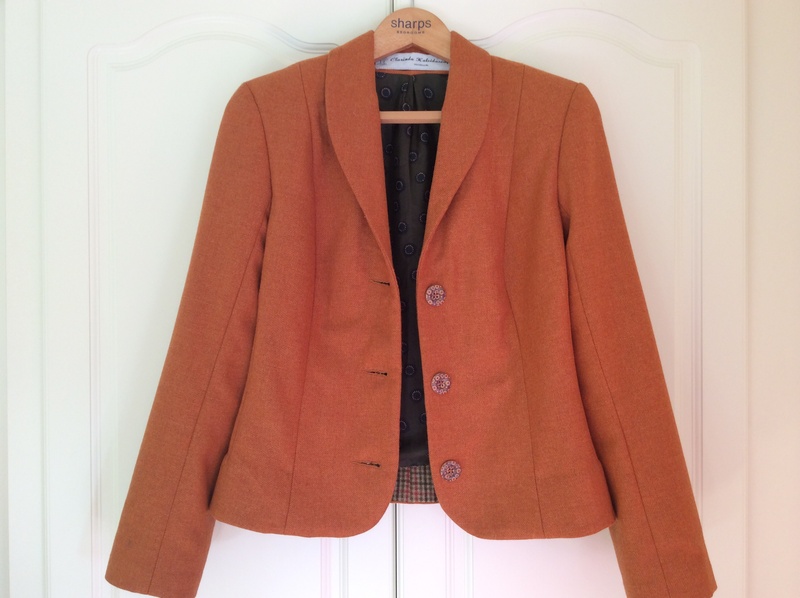 I ADORE Brora and have been admiring this jacket for a couple of months but really can’t afford the £325 price tag so I am going to make up a Francine version – I think I have been able to track down a similar Harris Tweed so we’ll see. 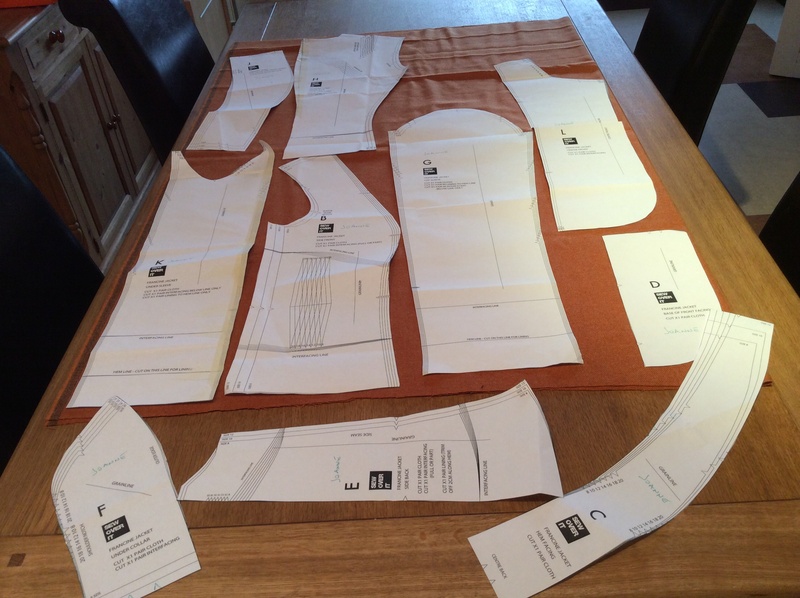 Earlier in the week I had the fourth of six lessons in my pattern drafting course at Cloth Kits. 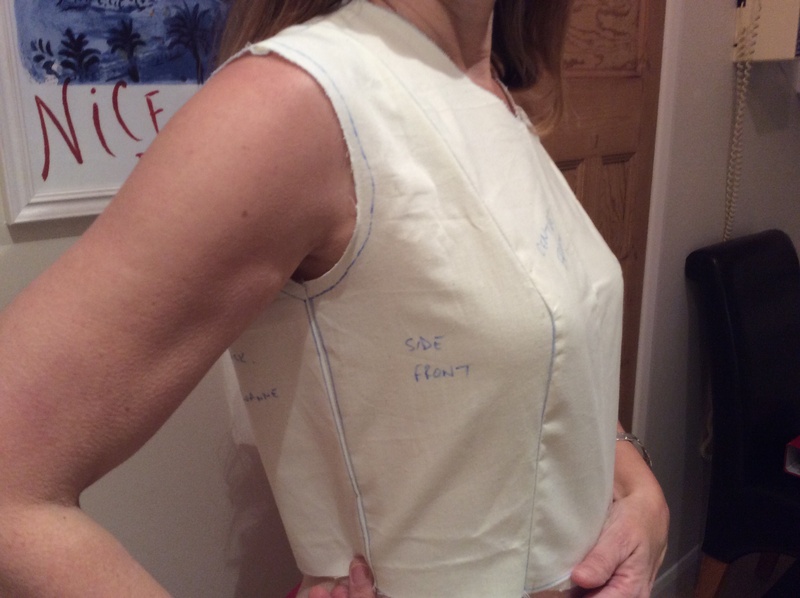 This week we were making our skirt block which was definitely more straightforward than the bodice and sleeves. The highlight of this week was a sneaky peak in the tutor’s studio. 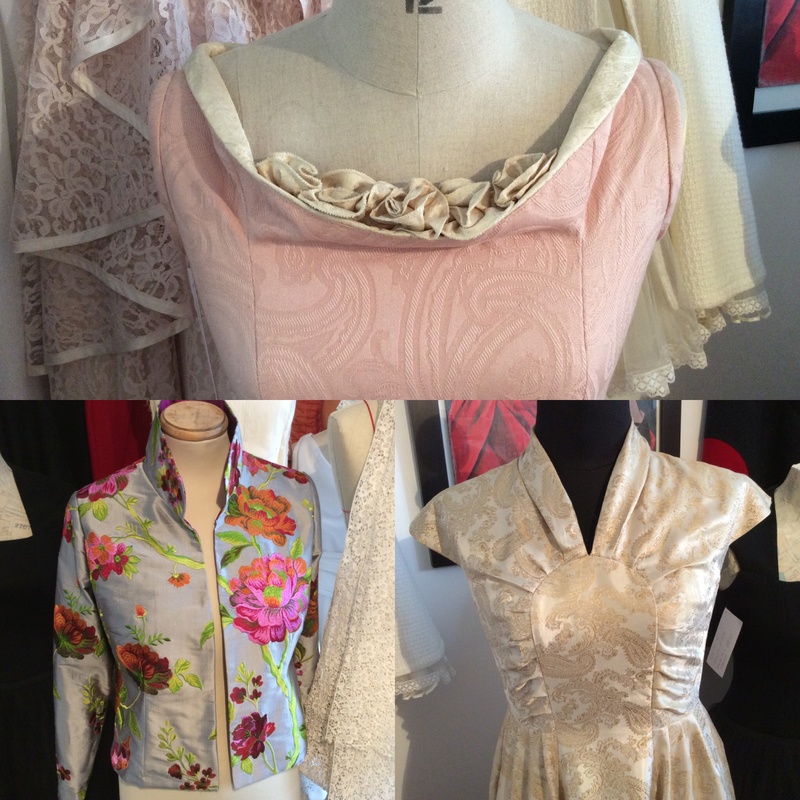 Maria Pulley, as well as teaching, has her own couture dressmaking business and her studio is above Cloth Kits. She is currently working on wedding outfits for a mature lady (see the floral jacket above) and her 91 year old mother. This nonagenarian lady has chosen a dress in blue silk and to go over it, this most gorgeous peacock feather coat. Isn’t that FAB? Imagine being 91 and having your own couture outfit – SO much for us to still look forward to. 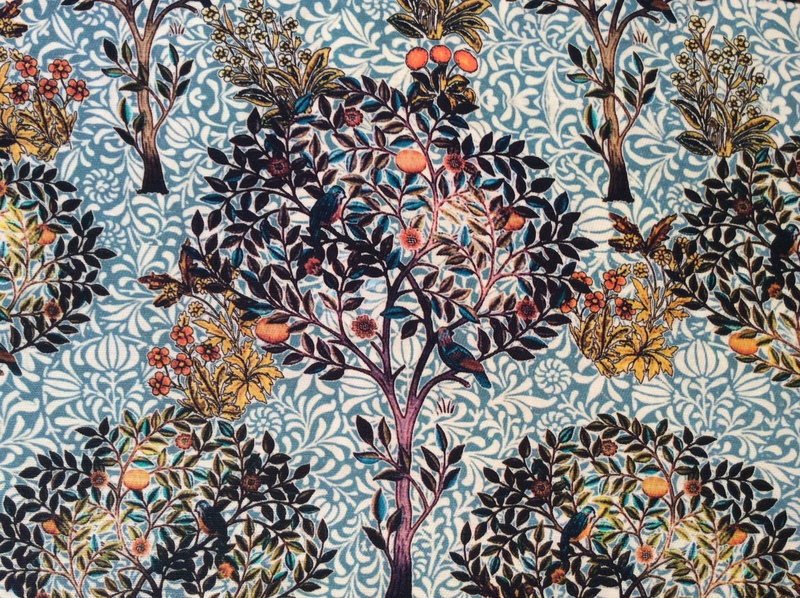 Whilst I was there this week, I noticed some new Liberty fabrics which had come in and were just being stored upstairs – I think they are “old” rather than new and Liberty have sold them off to their distributors. Anyway, this rather quirky design caught my eye. It is called Transport Threads. I bought 1.75 m – originally to make a shirt. It is incredibly thin – see-though I would say – so I am now thinking that maybe I might use it as a funky lining for a subsequent Francine. So another week has gone by without anything finished to share with you! 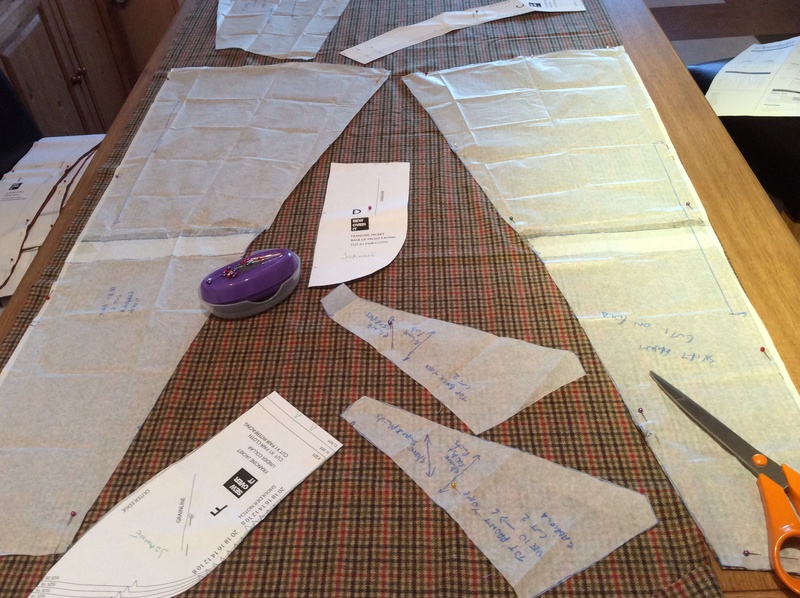 It’s funny but looking back over my blog, I was churning out a frock a week (I know, I know, some of you can do that in an evening) but now that I have a little more time on my hands, I am working at a slower, more thoughtful pace. In addition, I have been more involved in social sewing, or to be more precise eating. I have met two fellow sewers for lunch (hello Jane, hello Debbie!) 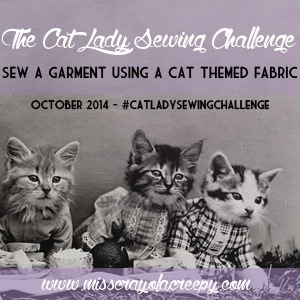 – it is so great to meet people and to talk about sewing and life. 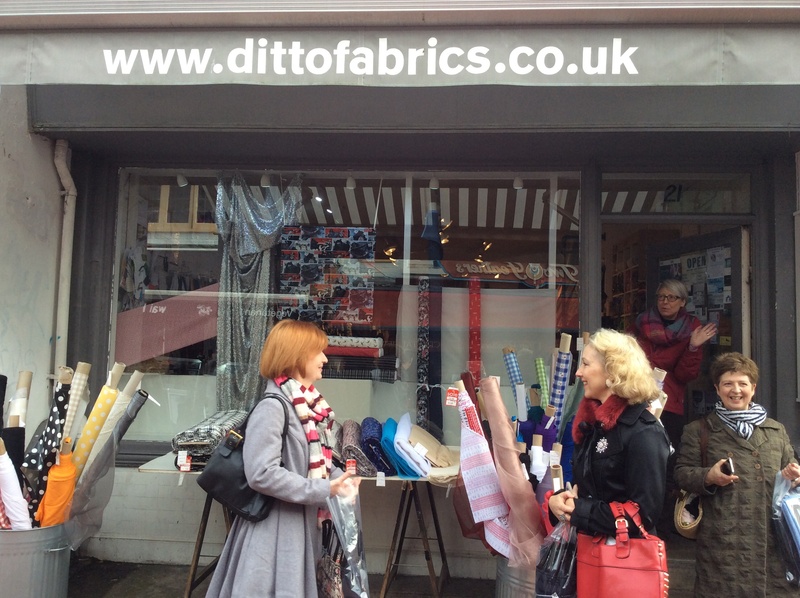 Inspired by the SEWBRUM bunch, a few of us who live on the South Coast are having a meet up for the first time this Saturday in Brighton and I am really looking forward to that – If you can get to Brighton and would like to join us for coffee and a mooch around Ditto fabrics, do let me know and I’ll give you the details – all are welcome. I do love this little community of ours. Ooh dear, I had better sign off before I get too maudlin!